First, I think it's a good-looking shoe. I like the colorful Callaway logo with matching heel. The shoe is completely waterproof. Using their trademark Rainsport/Drysport, the shoe has a moisture-wicking lining with a breathable, waterproof system. Do you have wide feet? Callaway has built these shoes with a XWT technology. This is a forefoot pad that you can adjust to the width of each foot. My favorite thing about the shoe is the Callaway Comfort Technology Gel Tongue. The tongue of the shoe is built with gel tubes that distribute the lace pressure evenly and uniformly across the entire surface of your foot. This helps to improve the circulation of your feet and make your foot more comfortable. 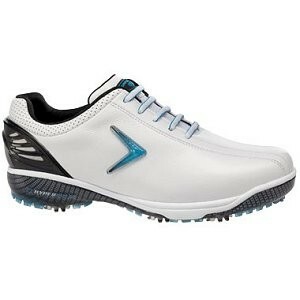 Finally, when I think about performance in a golf shoe, I look at the stability of the shoe and traction. This shoe has good stability using a hyperlite stability outsole with 7 new Chevron Comfort Spikes for excellent traction. For an even more stable shoe, I like the Adidas Tour 360 3.0 Women's Golf Shoe. This shoe has a really cool 360 wrap design that locks your foot in place.